The Academic Advising Program Assessment (AAPA) is a software tool that uses the standards and guidelines for academic advising programs as defined by the Council for the Advancement of Standards (CAS). Software DisclaimerNACADA encourages the sharing of tools and utilities that may assist others in their efforts to improve the quality or efficiency of academic advising on their campuses. The tools listed below have been made available by other NACADA members to the academic advising community. NACADA provides links to software tools as a convenience to its members and to the academic advising community at large. We are not liable for: Loss of data, incidental or consequential damages in connection with or arising from the use of the software or any related materials. NACADA does NOT Provide Updates And/Or Tech Support For any software. Contact the software provider with your questions or support requests. Despite the disclaimers above, this is not rocket-science. 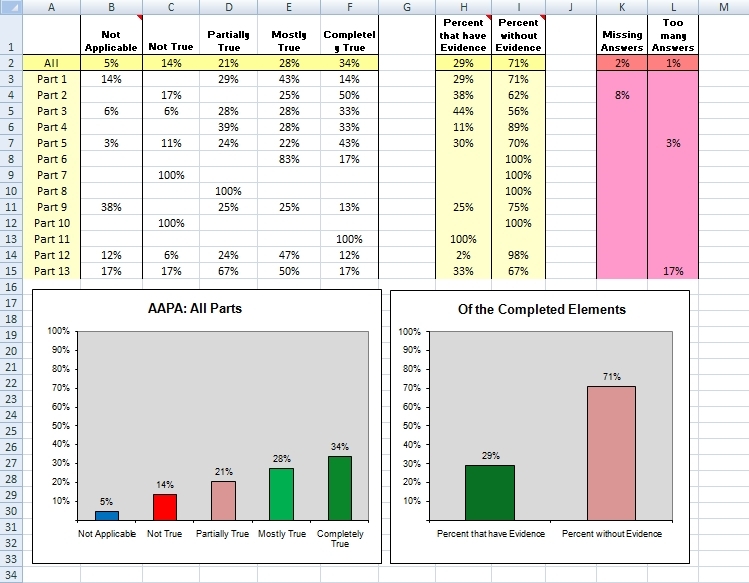 The AAPA software is one MS-Excel file. I think most people in higher education can handle that. 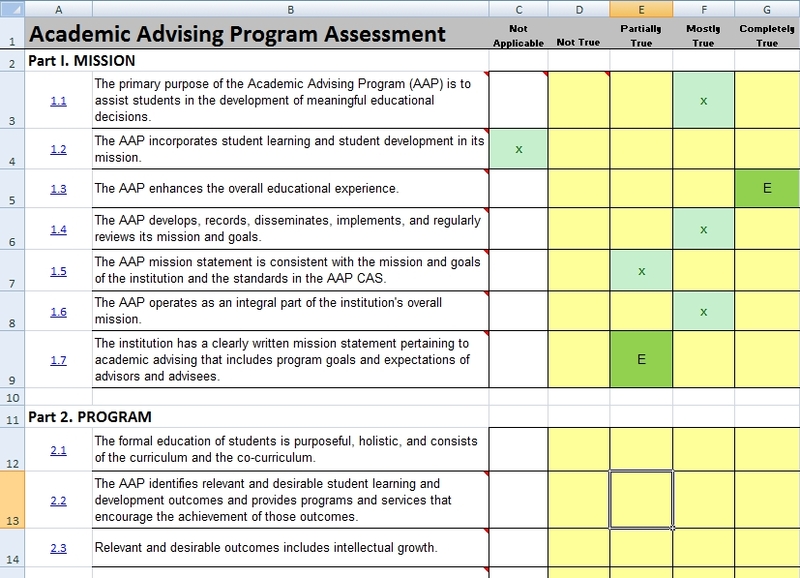 The 3.0 version of the Academic Advising Program Assessment Software uses the Academic Advising CAS as of December, 2012. The Assessment worksheet is used to indicate how your institution’s academic advising program meets each standard of each Part of the CAS Standards and Guidelines for Academic Advising Programs . Many of the standards on the Assessment worksheet have comments that suggest what kind of evidence could be used to assess whether or not the institution meets the standard. When indicating on the Assessment worksheet whether or not your institution meets the standard, you should enter an ‘E’ (or ‘e’) to indicate that evidence exists to support your assessment, or enter ‘X’ to indicate that no evidence exists that supports your assessment (anything besides ‘E’ will work as well). Standards are in bold, Guidelines are not. The ultimate goal is for your institution to fully meet all applicable standards with evidence to support each assessment. The Documentation worksheet is used to document the evidence used in the assessment. For each standard, enter the evidence used in making the assessment value. This is your proof of compliance. Note that one person’s opinion is not sufficient evidence to justify an assessment — they should document “why” they have their opinion. The Analysis worksheet is used to see the results of the assessment and to see if any data entry errors have been made. It is easy to see if multiple assessment values have been entered or if no value has been entered for a standard. Save the AAPA file for each assessment performed so you can see changes over time. …how to do something in MS-Excel, you should refer to a book on MS-Excel or do a search on-line. …how to install the AAPA spreadsheet, please remember that this is just an MS-Excel file. Save the .xlsx file to your computer and open the file just as you would any other MS-Excel file — which means you must already have MS-Excel installed on your computer! …a problem with the spreadsheet, contact me with a description of the problem and I will get back to you as soon as possible. …hiring consultants to help your institution perform an assessment using the methodology of the AAPA, you can contact NACADA’s Academic Advising Consultants and Speakers Service to arrange for consultants to come to your campus. The author of the software is also available for consultation.